This past Saturday I spent the day (six hours!) at the Gilmore Car Museum near Kalamazoo, MI. For anyone that lives in southwestern Michigan, or near the area, it is definitely worth the drive to go the museum. Their collection is quite expansive, as they have over 300 cars spread out in 12 different buildings, each housing a specific marque/genre. Some of the collections include; Piece-Arrows, Franklins, Model A Fords, Cadillac-LaSalles, and Lincolns. They even have a few standout cars like a 1948 Tucker, a 1963 Chrysler Turbine Car, a 1929 Duesenberg J-111 Dual Cowl Phaeton, and a 1916 Packard Twin-Six Racer. Not only is their collection expansive, but almost all of their cars are not roped off, meaning you can get up-close to examine the finer details. During my visit two things happened. The first is I spent approximately an hour looking at the various Lincolns in the Lincoln Motor Car Museum. These included many prewar cars, various Continentals, Mark cars, and a few Town Cars. The second thing that happened while I was at the museum, was there was a Lincoln car gathering happening on the campus grounds. There were over 50 Lincolns ranging from post WWII Cosmopolitans, fourth generation Continentals, various Mark cars, and Town Cars. During this time, I got to speak to some of owners and hear a few stories about their cars. After spending time around these cars and reflecting on the Lincoln brand, it occured to me that if Lincoln want to succeed, then they need to be unconventional. They need to stop chasing the Germans, Asians, and even Cadillac, and create a class of their own. When walking into the Lincoln Motor Car Museum, the first thing people see is the blue 1932 Lincoln KB Type 241 Convertible Sedan featured below. It is also parked next to a new MKZ. I heard many people comment how they did not like the looks of the MKZ. Instead, people turned and fixed their gazes on the 1932 Type 241 Convertible Sedan (how is that for a name?). I stood and stared at the car for over ten minutes, and during that time, there were around ten others doing the exact same thing. I heard one gentlemen say that standing in the same room as the 1932 Lincoln made him feel like he was sharing the same air with someone of high importance. The thing about the rest of the cars in the Lincoln Motor Car Museum (excluding the current production cars), is all of them have this type of charm that resonates class and dignity. These cars catch your eye and makes you stop and stare at their beauty. The cars in this collection represent the best of the brand. While some may argue that my heart was merely won over due to the lighting and showroom quality of these cars, the cars outside of the museum held the same prestige. Many of the cars at the Lincoln gathering are driven on a regular basis and (some) are not in showroom quality. Somehow a 1939 Zephyr with faded paint and a worn interior still has more prestige than a 2015 MKZ. 1939 Lincoln Royal Canadian Tour Car built for King George VI and Queen Elizabeth when the visited Canada. When was the last time the royal family had a custom Lincoln built for them? Seeing fourth generation Continentals and 30’s Zephyrs in motion allows one to see that those cars evoke a sense of high status. Standing on the museum grounds, people stopped in their tracks to watch these cars move. They catch your eye and make you think about how the people riding in the car have class and you standing on the street do not. These were cars that were exclusive and earned to be driven. The first generation of Zephyrs were a car that people asked Ford to build after seeing Edsel Ford’s personal custom Zephyr. Lincolns of today do not offer that same feeling. I would even argue that the fourth generation of Continental was the last car produced by Lincoln to offer this feeling. Bob Lutz argues a similar point, and after spending time with the cars that put Lincoln on the map, I agree 100 percent. Lincoln cannot be like their rivals. They need to create a product that is exclusive, different, and makes a statement. Think about it. Rolls Royce and Bentley are two brands that do not follow the norms of the automotive society and they are seen as THE premier luxury car. It should be noted that I am not arguing that Lincoln should become the American Rolls Royce/Bentley, but they should be unconventional. They need to not make the fastest, best handling sedan on the market, but rather a car that people earn to be driven in/drive. Luxury is suppose to be about exclusiveness. Seeing pictures of the new Continental and hearing industry experts talk about the car makes me think that the needle is moving in the right direction. I only hope the finished product does not lose any of its charm and that the automaker is able to spread that sense of class to the rest of its lineup. The cars featured in this post are just a few of the cars in the Gilmore collection and honestly, the photos do not do them justice. 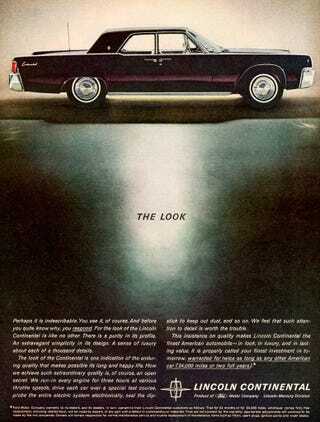 These cars are works of art and Lincoln needs to recapture this idea. I hope the new Continental succeeds, because Lincoln has too much legacy and pride for the brand to die.